"Give praise to the LORD, proclaim his name; make known among the nations what he has done. Sing to him, sing praise to him; tell of all his wonderful acts. Glory in his holy name; let the hearts of those who seek the LORD rejoice. Look to the LORD and his strength; seek his face always. Remember the wonders he has done, his miracles, and the judgments he pronounced, you his servants, the descendants of Israel, his chosen ones, the children of Jacob. He is the LORD our God; his judgments are in all the earth. He remembers his covenant forever, the promise he made, for a thousand generations,"
"A thousand generations! What an amazing perspective on Your faithfulness, Lord. Thank You for each opportunity I have to pass on Your truth to my grandchildren. Amen." 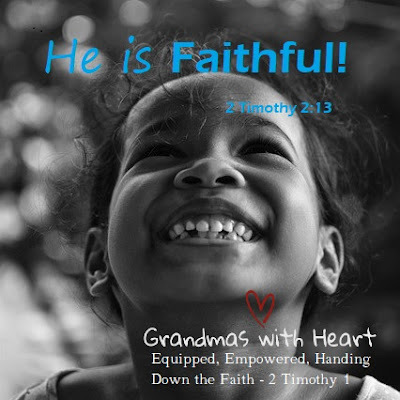 This is followed by a "Grandchild in Focus Prayer" which focuses our prayers on praying for our grandchildren as they develop their talents and gifts God has given them. I really love this Bible and how it "nourishes me so I can nurture" my grandchildren! I'm so thankful for God's amazing faithfulness!